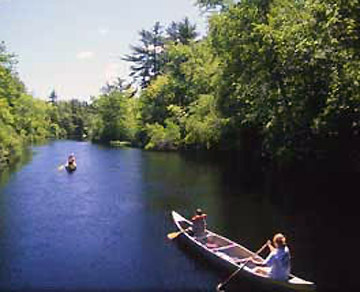 *From it’s earliest days, the people of Ipswich made frequent contributions to Harvard College. William Hubbard of Ipswich, the son of the Rev.William Hubbard, in his twenty-first year, ‘was one of that remarkable group of nine young men whom Harvard College sent forth in 1642, as the first specimens of high culture achieved in the woods of America.’ Four Ipswich scholars were of the Harvard class of 1659. The debt of gratitude that was due to Harvard College is abundantly recognized in the regular rates that were raised by taxation for the relief of the College.”- Ipswich in the Massachusetts Bay Colony, by Thomas Franklin Waters. Harvard College will celebrate its Commencement this year on May 26, 380 years from its founding. 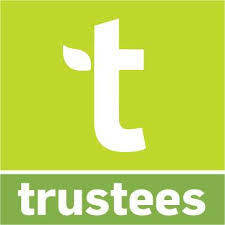 The University serves over 21,000 students including about 6,700 carefully selected undergraduates. The original college still stands amid a galaxy of professional schools, surrounded by libraries, laboratories, museums, and publishing facilities. Yet, it is the story of Harvard’s origin and development that will most interest those of us who love the story of New England. Famous statue of John Harvard (1607-1638) for whom the college was named. Executed by sculptor Daniel Chester French in 1884, he used student Sherman Hoar, a descendant of the founder, as a model since no image of John Harvard existed. 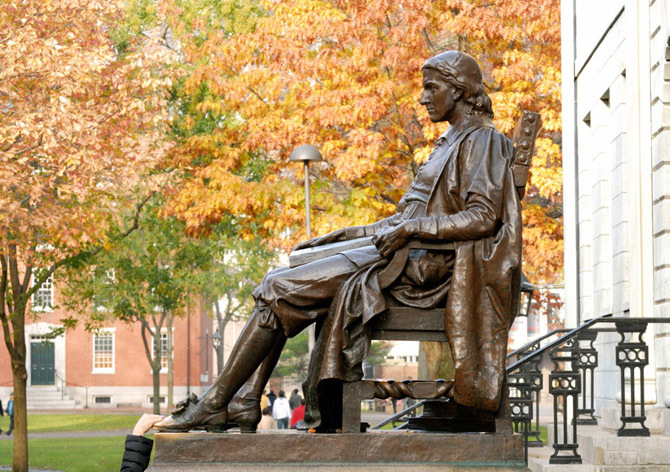 Visitors traditionally rub the left foot of Harvard’s bronze statue making it gleam in the sunlight. Soon after our Puritan forefathers arrived in the Bay Colony, they recognized the need for a college. Harvard was founded in 1636, not by one man, but by an act of the Massachusetts Legislature which granted £400 for the purpose. Later, Cambridge resident John Harvard left his sizable library and half of his estate to the young school, thus earning his place in history. Early New Englanders made no distinction between church and state, or between “public” and “private.” Income from the Charlestown ferry and other levies supported the college. 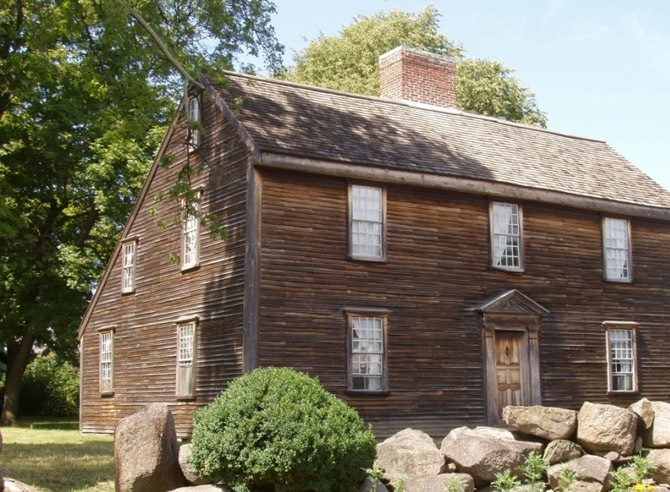 Financial troubles plagued the institution early on, an understandable circumstance given the meager resources and the harsh realities of everyday life in the colonies. Other problems surfaced. 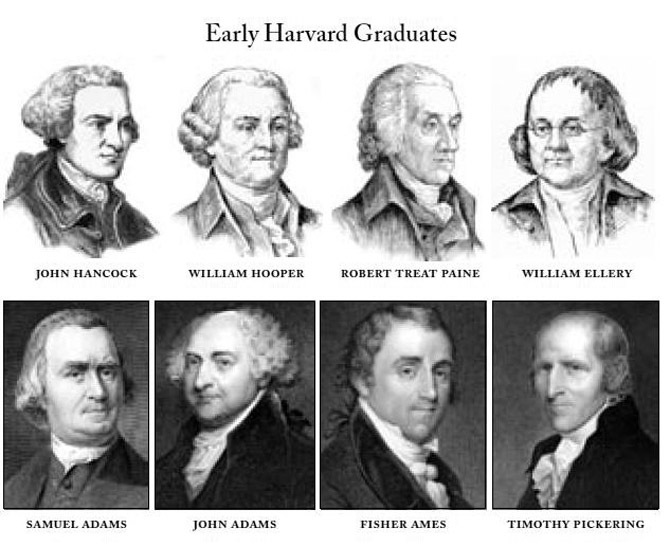 Harvard’s founding fathers were graduates of Oxford and Cambridge Universities. Although some wished to fashion the new college on their alma maters, most wanted to avoid the vanities and corruptions of their European counterparts. Harvard would be pure. 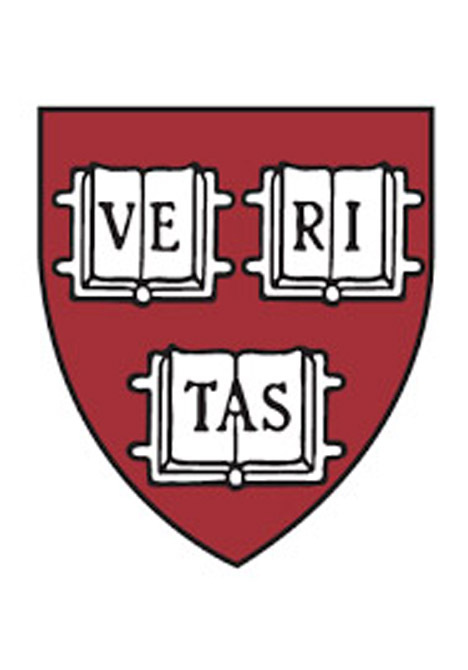 While not a divinity school as such, at least half of Harvard’s graduates entered the ministry during the first century of its existence. Secular learning was nurtured, but with a conservative, Puritan flavor. Harvard enjoyed its connection with the established church until after the Revolution. By then Puritanism had lost its clout as a host of religious controversies appeared, as divergent as the new Nation itself. The curriculum at Harvard in the early years was narrow. Latin, Greek, mathematics, English grammar, philosophy, and Bible studies formed the core offerings. The study of modern languages and experimental sciences remained outside formal instruction. Pupils learned by rote recitation, a restrictive approach for less mature scholars. Also, students matriculated much younger then. John Lowell of Newburyport, the first of that august clan to attend, entered in the class of 1721 at the age of 13. John Adams, class of 1775, enrolled at 16. 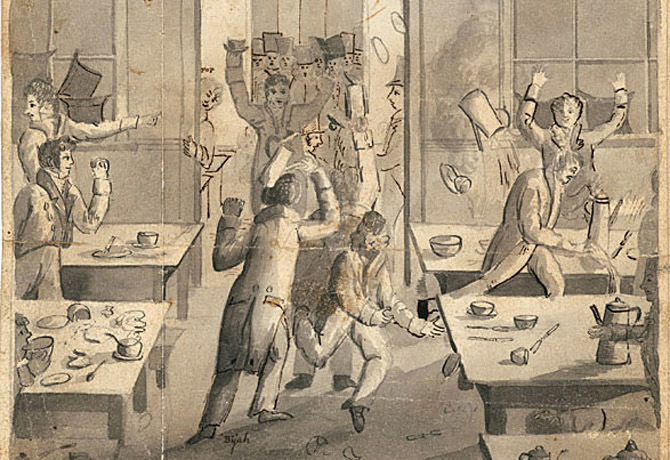 During the 1700s and early 1800s frequent riots occurred at Harvard. Some were savage. 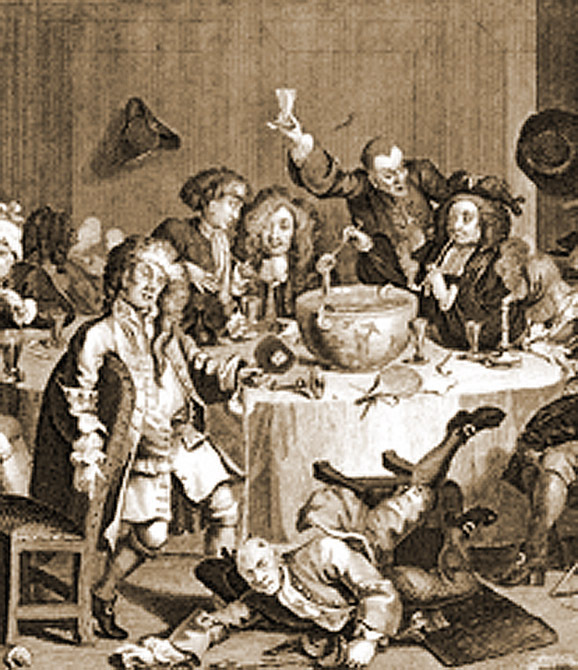 In 1818 all of the crockery in the commons was smashed during a spree. The historian William Prescott was blinded in one eye by a fiercely thrown crust of bread. The most serious disturbance erupted in 1823. As a result of the unrest, 43 seniors (over half of the class) were expelled before graduation. The list included names from the Commonwealth’s most prominent families – Adams, Amory, Choate, Coolidge, Crowninshield, Loring, Pickering, Sturgis, and Sumner. John Quincy Adams, then serving as Secretary of State, appealed to President Kirkland on his son John’s behalf but to no avail. When the dust settled, many changes were effected in Harvard’s management and curriculum. Students were given more choice in course selection, less supervision by beleaguered tutors, and greater control over their environment. Fines (which were more burdensome to parents than to students) were abolished. Sixteen became the minimum entrance age. Dissent did not disappear, but it became much less problematic. Two centuries ago, most Americans did not consider higher education the road to success. Young men of ambition served apprenticeships in counting houses or sailed as supercargoes in the China Trade. Entrepreneurs like the Derbys and Crowninshields of Salem, and the Perkins and Appleton clans of Boston had little formal education. It was their sons, along with their less wealthy classmates, who attended Harvard during the “Golden Years” of the late 19th century. They studied under the philosopher George Santayana, the psychologist William James, the naturalist Louis Agassiz, the historian Fredrick Jackson Turner, and the poets James Russell Lowell and Henry Wadsworth Longfellow. Harvard’s strength has always been its scholarship. Well into the 21st century, its faculty still includes an impressive number of America’s most influential writers and intellectuals. Its international outreach and prestige are formidable. The people of the Massachusetts take justifiable pride in the accomplishments of an institution that has so greatly enhanced the history of our state – VERITAS! Catherine Drinker Bowen (1897-1973) wrote several popular biographies of historical figures. Her Adams biography was a “Book of the Month” selection in 1950. “The crowd began drifting into town on Monday … There were Indians with bows and arrows to shoot for coins; Negros and beggars; children in hordes scattering across the grass like bits of paper before arriving coaches and horseback riders; merchants and members of the Governor’s Council, splendid in brocades and the gold-laced coats forbidden to Seniors. “The roads to Cambridge were a cloud of dust, the Charlestown ferrymen at their wit’s end with the boats from Boston piled up water-deep. People fell in and were fished out, only to be knocked down again at the landing by the crowd. Everybody laughed, joshing the pair of constables on the pier who struggled hopelessly for order. “Visitors from far away lodged at inn or boardinghouse or out under a tree; they slept on three chairs when three chairs were available. They drank ale and rum and flip and negus and Madeira; they made innumerable bad puns. 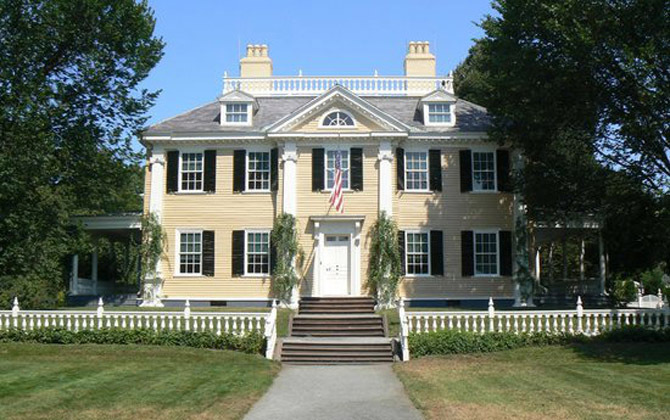 The old boys, wigged, powdered, limping with gout, compared Harvard of their day with Harvard of the moment, to the great disadvantage of the latter, when boys – more fops it seemed – lacked the virility of their fathers who had rolled cannon balls off the roof of Old Harvard and painted red the face of the clock of Massachusetts Hall. How will sea level rise affect Ipswich?